aFrom the Department of Diagnostic Radiology and Nuclear Medicine (N.K., D.G., A.S., V.F., E.R.M. )bGreenebaum Cancer Center (V.F. ), University of Maryland School of Medicine, Baltimore, Maryland. SUMMARY: Initially used in the treatment of prostate cancer and uterine fibroids, the role of focused ultrasound has expanded as transcranial acoustic wave distortion and other limitations have been overcome. Its utility relies on focal energy deposition via acoustic wave propagation. The duty cycle and intensity of focused ultrasound influence the rate of energy deposition and result in unique physiologic and biomechanical effects. Thermal ablation via high-intensity continuous exposure generates coagulative necrosis of tissues. High-intensity, pulsed application reduces temporally averaged energy deposition, resulting in mechanical effects, including reversible, localized BBB disruption, which enhances neurotherapeutic agent delivery. While the precise mechanisms remain unclear, low-intensity, pulsed exposures can influence neuronal activity with preservation of cytoarchitecture. Its noninvasive nature, high-resolution, radiation-free features allow focused ultrasound to compare favorably with other modalities. We discuss the physical characteristics of focused ultrasound devices, the biophysical mechanisms at the tissue level, and current and emerging applications. Experimentation with neurologic FUS applications began in earnest more than 60 years ago with partial ablation of the basal ganglia in cats and monkeys in 1955 by Fry et al3 and intracranial tumor therapy in humans performed by Heimburger4 3 decades later. Initially, impedance mismatch and nonuniformity at the soft-tissue-calvarial interface necessitated surgical craniotomy for intracranial FUS application. Once reliable transcranial propagation was achieved, the morbidity associated with craniotomy was no longer an obstacle in neurologic FUS application and the technique gained more widespread acceptance as a viable noninvasive alternative to current therapeutic options. Clinical and preclinical investigations into potential applications of the controlled deposition of mechanical energy, in the form of ultrasound, have since accelerated and yielded a variety of bioeffects based on the level of energy deposition. At high levels of deposition, tissue heating generates irreversible necrosis of the target area. 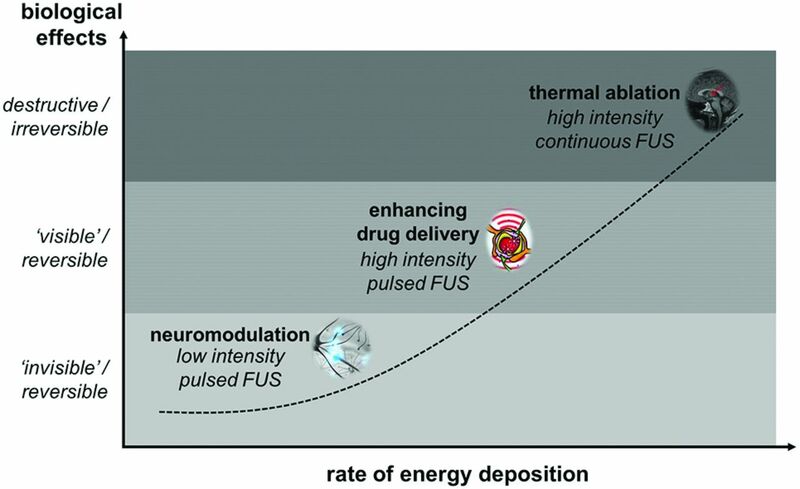 As the temporally averaged rate of energy deposition is decreased, via decreasing the ultrasound intensity and duty cycle (ie, ratio of ON and OFF), mechanical effects can increase the permeability of the blood-brain barrier and influence neuronal activity, via both reversible suppression and stimulation. Developments in real-time image guidance and monitoring have expanded the scope of FUS therapies, namely the integration of MR imaging–guided therapeutic systems. Early image guidance of FUS relied entirely on diagnostic ultrasound images for treatment planning and monitoring tissue-level effects, such as in the treatment of prostate cancer.7 Current MR imaging–guided therapeutic systems offer superior soft-tissue detail, allowing preservation of nontarget tissues and accurate identification of tumor margins and other potential ROIs. Temperature maps via noninvasive, near-real-time MR thermometry enable validation of effective treatment for thermal therapies (ie, ablation, hyperthermia) and determination whether the nontargeted tissue in adjacent regions has been spared. The versatility of the MRgFUS apparatus is a product of its ability to manipulate the volume and degree of energy deposition. The magnitude of local energy deposition generated by focused acoustic wave propagation is influenced by the intensity and duty cycle of the ultrasound application. High-intensity, continuous FUS application can generate marked focal temperature elevation, reaching up to 65°C or greater (with tissue devitalization generally achieved at temperatures exceeding 55°C)8 within a matter of seconds. When FUS is applied in a pulsed, high-intensity fashion, cooling can occur between the pulses and the temporally averaged intensity can be lowered substantially. These factors lower the temperature elevations to just a few degrees Celsius. As a result, mechanical effects predominate on local cytoarchitecture, without irreversible thermal injury.9 Further reduction in energy deposition is achieved with a pulsed low-intensity application, which may generate unique neuromodulatory effects with negligible temperature elevations (Fig 2). Unique biologic effects can be achieved over a range of energy-deposition rates by manipulating the intensity and duty cycle of the ultrasound application. These include neuromodulation, localized reversible enhancement of blood-brain barrier permeability, and thermal ablation. The therapeutic benefit of high-intensity continuous FUS application is related to the degree of localized temperature elevation, resulting in irreversible coagulative necrosis at the tissue level, and is the basis of ablative therapies. The treatment of benign prostatic hyperplasia and prostate cancer was the earliest clinical application of this form of FUS and used a transrectal transducer and a collinear ultrasound imaging transducer for both treatment planning and monitoring. Newer generation devices use MR imaging guidance and were first used for the treatment of uterine fibroids.7 The use of MRgFUS in the treatment of uterine fibroids has since acquired FDA approval and is reimbursed by insurance providers on an individual basis. The advent of transcranial devices has provided the impetus for investigation into a variety of neurologic applications. An effective and safe protocol for MRgFUS in the treatment of primary solid intracranial neoplasms remains more elusive. The infiltrative nature of primary gliomas makes ablation uniquely challenging. In a small clinical trial assessing the role of MRgFUS in the ablation of high-grade gliomas, coagulative necrosis and complete ablation of the tumors were not achieved in 3 patients undergoing MRgFUS treatment. After modification of the protocol, a fourth patient who underwent treatment had successful ablation of the tumor but with fatal intracranial hemorrhage a few days after treatment, possibly related to an underlying coagulopathy. Current understanding is that lower frequency application, as attempted in the fourth patient, seems to be associated with an increased risk of bleeding.14 A universal protocol has not yet been established in the ablation of primary gliomas, and continued investigations are necessary. More recently, Yoo et al28 achieved reliable neurostimulation and reversible suppression by using remote low-intensity FUS in a rabbit model, as confirmed by fMRI and electroencephalographic recordings (Fig 5). Concurrent MR thermometry measured temperature elevations of approximately 0.7°C, well below levels required to cause tissue devitalization.8 Most important, the FUS exposures did not result in damage to the BBB as demonstrated by the absence of enhancement on postcontrast MR imaging or cytoarchitectural distortion as confirmed by histologic evaluation.28 Low-intensity FUS for neuromodulation is one of the newest applications of FUS currently being investigated. Preliminary studies have been promising, and research is ongoing. High-intensity MRgFUS shares a great deal of therapeutic overlap with surgical resection and stereotactic radiosurgery, albeit with a few important distinctions. Both MRgFUS and radiosurgery compare favorably with surgical intervention in that both do not require surgical craniotomy. While radiosurgery is a mainstay in the treatment of intracranial neoplasms, its role in nonneoplastic pathologies is somewhat limited due to ionizing radiation exposure. In contradistinction, MRgFUS offers reliable, high-resolution energy deposition without radiation exposure or thermal injury to nontarget intracranial tissues. FUS offers unique benefits as a therapeutic technique in influencing neuronal activity. FUS-induced neuromodulation does not require surgical craniotomy as is required for deep brain stimulation or subdural and epidural cortical stimulation. 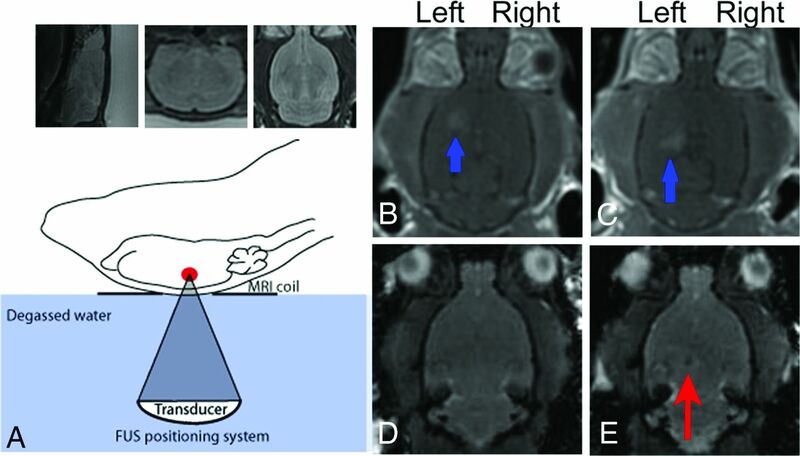 Other noninvasive systems, such as transcranial magnetic stimulation and electroconvulsive therapy can be effective; however, they offer inferior spatial resolution.35 The superior spatial resolution offered by FUS could complement functional imaging modalities such as fMRI, to potentially serve as a powerful tool in functional connectivity studies. Important obstacles remain in the development of FUS as a clinical tool. Further investigations into safe and effective protocols in the ablation of gliomas are needed because its role has lagged behind that of thalamotomy in the treatment of movement disorders and neuropathic pain. 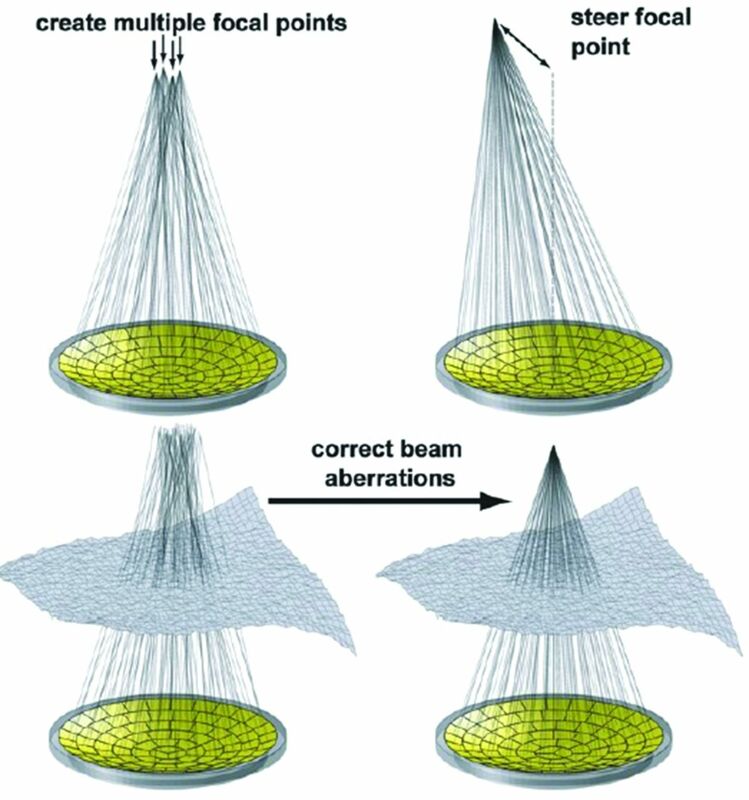 Achieving generalizability has also been challenging, most notably due to the limitations of acoustic accessibility in the ablation of superficial lesions or treatment envelope and in patient selection based on heat generation at the calvaria. Overcoming these limitations is actively being investigated. The discovery of a noninvasive method of focusing mechanical energy, in the form of acoustic waves, within the parenchyma has heralded a new age of investigations into clinical and research applications. In the brief time since transcranial acoustic wave propagation was achieved, FUS has empirically demonstrated efficacy in the ablation of tissues, therapeutic agent delivery, and neuromodulation. The ability to focus acoustic wave propagation noninvasively on the scale of a few millimeters while manipulating the magnitude of energy deposition to create unique bioeffects offers versatility that is unparalleled in neurotherapeutics and research (Table). The role of FUS appears destined to expand as investigations into its utility continue at a rigorous pace. Disclosures: Dheeraj Gandhi—UNRELATED: Expert Testimony: Occasionally (<1 year) provided expert testimony on medicolegal cases related to cerebrovascular disease; Royalties: Cambridge Press. RELATED: Grants/Grants Pending: Insightec, Medtronic, National Institutes of Health, Stryker. Victor Frenkel—UNRELATED: Grants/Grants Pending: Focused Ultrasound Foundation,* Comments: This was a 1-year grant of $100,000 to Dr Paul Fishman (Principal Investigator) of the VA Hospital affiliated with the University of Maryland School of Medicine. From this grant, I received 5% effort for my salary for 1 year, during which our article was conceived and written. The funding was, however, for my work on a preclinical study on using focused ultrasound to enhance stem cell delivery to the brain. It was not in any way related to working on this article. The Foundation is a nonprofit organization whose mandate is to increase awareness of focused ultrasound and its implementation in the clinic. This funding has ended, and we recently received notification from the VA System that our grant, which follows this work, is also to be funded. *Money paid to the institution. Paper previously presented in part at the Annual Meeting of the American Society of Neuroradiology and the Foundation of the ASNR Symposium, April 25–30, 2015; Chicago, Illinois.